One hears all kinds of theories as to how to improve one’s photography. Whether it’s exhortations to read your camera manual, take pictures everyday, look at photos by the great masters, or attend workshops, it’s all good enough advice as far as it goes, and some of it (such as reading one’s manual) is essential. Nonetheless, if I were asked what is the one thing that is mostly likely to improve one’s photography, it would be: get a prime lens and use it. You don’t have to use it exclusively or get rid of all your zoom lenses. But I suspect that for most people (not necessarily everybody), confining oneself to a prime for at least part of one’s photography serves as an excellent exercise which helps develop compositional skills and an appreciation for how aperture relates to depth of field. Prime lenses have the additional advantage of generally being superior, in terms of image quality, to zooms. They also tend to be less expensive, sometimes considerably less expensive, than zooms. My experience at Maroon Bells in Colorado reinforced my suspicions that the over-use of zoom lenses is inhibiting the development of photography. That morning there must have have been close to 100 photographers at the lake. The gentlemen shooting next to me had a Fuji panorama camera with a prime lens. Further on the down row there was a Leica shooter. As far as I could tell, those were the only two photographers (other than myself) who were using prime lenses. Every other camera I saw had a zoom lens stuck to it. Some of them were big expensive zooms; others were little cheap zooms. But they were all zooms, and they stunk of conformity and lack of personal initiative. Let me set the stage and drive the point home even more forcefully. Curiously, a Canon shooter to my right, seeing me shooting just off the ground, after certain point decided he would do likewise. Monkey see, monkey do — only this particular monkey failed to understand the rationale behind shooting close to the ground. I was shooting close to the ground so that I could frame my shot with that rock in the corner. There was no way the Canon shooter to my right could have framed the rock within the field of view of his zoom lens, so there was little point in him imitating me. Incidentally, I have run across this imitative behavior before when shooting from popular spots. At Glacier while shooting at the Wild Goose Island overlook I got a bit bored with this over-photographed locale and decided to head down the side of the hill toward the edge of the lake, in search of a fresh perspective. As soon as I began scampering down the hillside, a half a dozen photographers rushed after me. All of them, of course, were shooting with zoom lenses. Something similar happened to me at the Dallas Divide in Colorado. Now I’m not suggesting that zoom lenses cause people to become conformist zombies, or that a prime lens will guarantee individuality and self-initiative. But zoom lenses do tend to reinforce the conformist tendencies that exist in most people, while primes force one to think for oneself. With a prime lens, you are trapped at a specific focal length, and have to make the best of it. The prime lens stuck to your camera may seem completely wrong for the type of photograph a given scene demands. But this very fact forces you to look at the scene with fresh eyes. You have to come up with something unique, different, original. With zoom lenses, we all tend to take the most obvious shot: in other words, the cliche shot. For 1980, when I first started shooting with an SLR camera, to 2003, I shot almost exclusively with prime lenses. Then I switched to shooting almost exclusively with a zoom lenses. The convenience of using a zoom lens was liberating at first; but more often than not, it led to boring, cliche photographs. In the last few years, I’ve begun to shoot more with primes, and I’ve begun taking better photos as a result of it. Now this is far in the way the best photo I’ve ever taken of False Klamath Cove. It was taken with a 28mm prime lens. That day I had been out attempting to photograph critters with a large, heavy 300mm lens. Well, there wasn’t much wildlife to shoot so I decided to try some landscape shots. 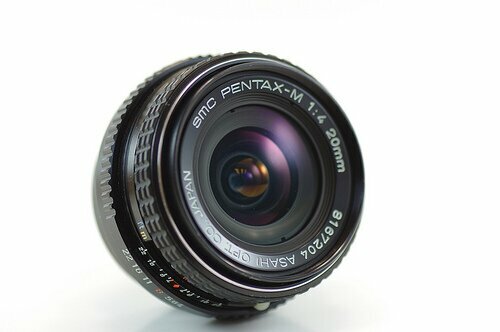 The only problem was, I had no other lens but an old 28mm. So I went out and tried to make the best of it. Over the years, I have probably taken over 100 photographs of False Klamath Cove, all with zoom lenses and none of them any good. I kept trying to take the most obvious shots. But the obvious shots were all cliche shots and weren’t very compelling. With that 28mm lens stuck to my camera, I was forced to go and look for something different. Suddenly, I began to see things I had never noticed before, such as these rocks, which made for a nice subject. This process of looking for a subject constitutes an excellent exercise for developing compositional skills. Ansel Adams famously said “You don’t take a photograph, you make it.” Well that’s precisely what a prime lens forces a photographer to do: to make, rather than merely take, the image. Now I’m not suggesting in all this that one shoot exclusively with prime lenses. Zoom lenses have their use and in some situations are absolutely necessary. The problem is not that photographers are shooting with zoom lenses, it’s that they are shooting exclusively with zoom lenses. I suspect there are many photographers, particularly from the under 30 crowd, who have never shot with a prime lens. This is all rather shocking, particularly when one reflects that most of the iconic photos taken since the invention of photography, from Matthew Brady’s Civil War photos to Ansel Adam’s landscape masterpieces, were taken with prime lenses.